I was considering holding on to this item for some future episode of the Sentinel Hill Press-cast, but I suspect this story might be better served in a visual medium rather than in a podcast. Our subject today is a fish, of sorts. The precise origin of the so-called “Sacred Cod” that hangs in the Massachusetts ‘State House’ are clouded, but the first written records we have of it date from 1784 when John Rowe, a state representative moved that a painted wooden effigy of a cod “a memorial of the importance of the Cod-Fishery to the welfare of this Commonwealth” be mounted in the Massachusetts House of Representatives. Mr. Rowe, a Patriot and Mason, likely paid for the creation of the Cod. Some sources claim that there was an earlier Cod erected by Samuel Sewall, who readers will recall was a judge at Salem, and that Rowe’s Cod was meant as a replacement for the earlier version which had been destroyed when the House of Assembly burned to the ground in 1747. That Sewall makes no reference to any cod in his diary, undermines this colorful story, unfortunately. We do have evidence for an earlier Cod at the Old State House, as there are records of payment of 15 shillings “to painting codfish” to Mr. Thomas Crafts in 1773. This second Cod is presumed lost at some point during the American Revolution, but this, like so much about the earliest history of the Cod, is just a supposition. 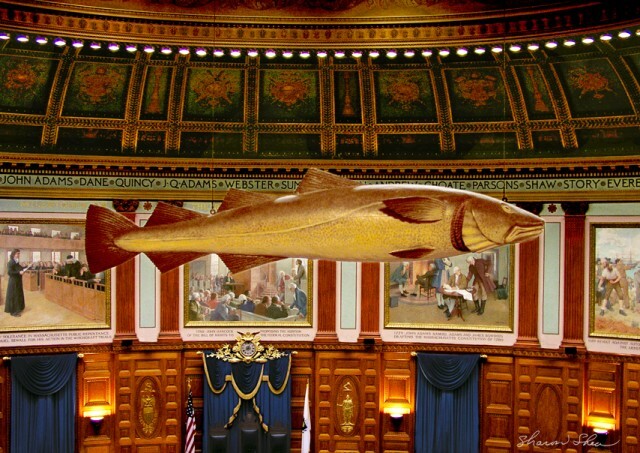 In 1895 A History of the Emblem of the Codfish in the Hall of the House of Representatives was published at the behest of a special committee of the Massachusetts House of Representatives who had be tasked with deciding whether or not to relocate the Cod to the newly constructed House chamber. It was decided to continue the tradition and keep the Cod displayed in the House chamber and it was relocated there with great pomp. The Cod has hung there ever since, aside from a repainting once or so a generation, but for two brief period when it was stolen by pranksters – first by members of the Harvard Lampoon in 1933 (shown above just after its recovery) and again by University of Massachusetts Boston students in 1968. They get a lot of fish and lobsters and do exporting by truck. Queer how the fish swarm right there and nowhere else. Of particular interest to Lovecraft Country enthusiasts is a slightly smaller representation of the ‘Cod’, not in wood, but in tin. In 1928 the Massachusetts Bureau of Motor Vehicles modified the license plates adding a small figure of a fish. According to tradition, there was an immediate negative reaction by the fisherman of Massachusetts who blamed the poor fishing that year on the image of the cod on the state license plate figuratively swimming away from the state.